The Kpreps rankings have taken on quite a different look this week, especially at the top. We have four new teams occupying the top spot, but only three No. 1 teams suffered losses on Friday. Where are the changes? Find out with the Kpreps rankings for Week 4! After Derby’s run of 19 consecutive weeks atop the Kpreps Class 6A poll ended last week, we have a new No. 1 again this week. Lawrence Free State carried the flag for the state of Kansas on Friday as the Firebirds knocked off the top-ranked team in Missouri, Park Hill, 21-16. Free State was only one of two Kansas teams (Shawnee Mission Northwest) to win in the Sunflower-Suburban Showdown pitting teams between the Sunflower League in Kansas and the Suburban Conference in Missouri. The Missouri schools shut out Kansas in winning all ten games last season. Shawnee Mission East drops one spot in this week’s poll to No. 2 after a 21-17 loss to Rockhurst. This game was not part of the Sunflower-Suburban Showdown, but, like last season, was a great game between two evenly matched teams. The Lancers rallied from a 14-3 deficit to take a 17-14 lead before Rockhurst scored a fourth-quarter touchdown to win. Derby remains at No. 3 this week after the Panthers put up nearly 700 yards of total offense in a 60-28 win over Maize. Topeka High also rolled to a big win over Emporia, 62-13. Ky Thomas rushed for more than 200 yards in the win, while quarterback Da’Vonshai Harden passed for 222 yards and four touchdowns. Blue Valley reenters the top five at No. 5 this week after a dramatic 34-33 win over last week’s No. 4 Blue Valley North. The Tigers trailed the Mustangs 33-24 with 1:06 remaining, but got a touchdown, onside kick, and a Jackson Likens 27-yard field goal with 15 seconds left to win. A week after dominating Derby, Goddard avoided a letdown by pulling out a win against Andover on Thursday. Blake Sullivan scored on a short touchdown run with just over a minute remaining to help the Lions avoid the upset with a 21-17 win. St. Thomas Aquinas drops one spot in this week’s poll after falling to 4A-I No. 1 Bishop Miege, 27-14. The Saints pulled to within 20-14 on a Camron Jackson touchdown run with 6:28 remaining, but Miege would score on a long run on the ensuing possession to extend the game to two scores. Bishop Carroll remains in the No. 3 this week after routing previously-unbeaten Wichita West, 45-14. Braden Howell passed for 224 yards and a pair of touchdowns to lead the Golden Eagles. St. James Academy remains in the No. 4 spot this week after grinding out a 17-6 win against Gardner-Edgerton. Defending champion Mill Valley rounds out the top five this week. The Jaguars put up 51 points in a 25-point win over Blue Valley Southwest. Mill Valley travels to 6A No. 5 Blue Valley this week. Bishop Miege won the battle of top-ranked Eastern Kansas League teams by using a pair of big plays to win 27-14 at St. Thomas Aquinas. Miege quarterback Carter Putz hit Daniel Jackson on a 98-yard touchdown pass to extend the Stag lead to two scores. It was Putz’s 93rd career touchdown pass; a new Kansas state record. Aquinas would pull within six points again in the fourth quarter, but Miege would answer as Brison Cobbins went untouched on a 59-yard touchdown run. The remaining four spots in the 4A-I poll also remain unchanged. Maize South still hasn’t allowed a point after the Mavericks went to KC Washington and won 58-0. Maize South’s defense could get a big test this week when No. 5 Buhler comes calling. The Crusaders knocked off then 4A-II No. 1 Wichita Collegiate on Friday behind 305 rushing yards from Dalton Brown. De Soto remains in the No. 3 spot this week as the Wildcats dominated Louisburg, 41-0 in the Fan’s Choice for Kpreps Game of the Week. De Soto will take on another unbeaten Frontier League opponent this week when the Wildcats host Paola. Finally, fourth-ranked McPherson jumped out to a 38-0 lead after three quarters in beating Winfield, 38-14. The Bullpups had faced ranked opponents the first two weeks of the season before taking on the Vikings. McPherson will travel to unbeaten Augusta this week. There is quite a bit of movement in this week’s Class 4A-II poll as the top two teams in the state lost last week. That opens the door for the Columbus Titans who move into the No. 1 spot this week after a 54-7 rout of CNC League rival Girard. Columbus had the Trojans circled on the schedule after Girard upset the Titans 28-24 in the first round of the 4A-II playoffs last season. Scott City and defending champion Pratt each move up two spots to No. 2 and No. 3, respectively, this week. The Beavers went on the road and grabbed a 34-6 win over Cimarron, while Pratt controlled the Central Kansas League showdown with Nickerson in winning 28-14. Wichita Collegiate falls to No. 4 in this week’s poll after the 47-21 loss to 4A-I No. 5 Buhler. The Spartan defense was gashed for nearly 500 yards on the ground against the Crusaders. Things won’t get any easier this week as Collegiate travels to take on Mulvane and dual-threat quarterback Jayden Price. Finally, despite a 1-2 record, Topeka Hayden holds on to the fifth spot in this week’s poll. The Wildcats fell to unbeaten Topeka Seaman, 17-6 on Friday. Hayden committed four turnovers in the loss to the Vikings, but only trailed 10-6 until the fourth quarter. We also have some movement top the Class 3A poll this week. Despite Silver Lake’s 27-20 win over Mid East League rival St. Marys, our voters dropped the Eagles to No. 2 in this week’s poll. As a result, Nemaha Central takes over the top spot after the Thunder defeated Holton 30-18 on Friday Night. Silver Lake’s fall wasn’t very significant considering only three votes have separated the top three teams in the Class 3A poll in each of the past three weeks. Phillipsburg remains in the No. 3 spot after the Panthers’ 41-0 win over Plainville. Conway Springs retains the No. 4 spot this week after another dominating performance against a Central Prairie League member. The Cardinals beat Douglass 54-0 and have outscored their three league foes 212-18 thus far this season. Marysville picked up another big North Central Kansas League win as the Bulldogs pasted Wamego, 50-13. The Bulldog offense is averaging more than 48 points per game under the direction of senior quarterback Jack Blumer. The Class 2-1A poll saw no changes this week, although things are really tightening up between the top seven or eight teams. Smith Center in the No. 1 spot after blasting Thomas More Prep 61-14. The Redmen get another Mid-Continent League test this week when they host undefeated Norton. Jefferson County North continues to roll through Northeast Kansas League schedule as the Chargers beat Pleasant Ridge, 58-20. The Chargers have scored 158 points in three games this season, while giving up only 33. Lyndon had little trouble with Central Heights on Friday in a 55-6 win. The Tigers are averaging 57 points per game and have an average scoring margin of more than 47 points per game. Valley Heights remains in the No. 4 spot this week after a 46-13 win over Christ Prep Academy, while fifth-ranked Ell-Saline doubled-up Heart of America League rival Moundridge, 28-14. Valley Heights makes a long road trip out to Ellis (2-1) this week, while Ell-Saline will travel to Inman. Centralia and St. Mary’s Colgan continue to pressure the top five in the Class 2-1A poll. Top-ranked St. Francis wins the award for the most unusual score this week. The Indians won at Hill City on Friday, 50-4. St. Francis will travel to winless Oberlin-Decatur County this week for a tune-up before hosting a really good Hoxie team in Week 5. Defending champion Osborne remains in the No. 2 spot after blasting Lakeside-Downs, 70-6. Senior Denton Schurr rushed for 132 yards and three scores as the Bulldogs put up more than 380 rushing yards on the Knights. Osborne gets a major test this week when the Bulldogs visit 8-Man, Division II No. 2 Pike Valley. Burlingame remains ranked third this week. The Bearcats welcomed back senior quarterback Dalton Sporing in a 61-0 win over Lebo. Sporing, who has been recovering from a knee injury suffered during basketball last spring, passed for 86 yards and carried one time for a 30-yard touchdown in the win. Spearville remains in the No. 4 spot this week after the Royal Lancers rolled to a 54-8 win over Minneola. 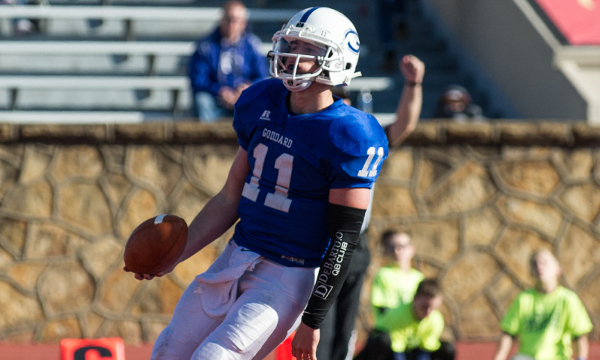 Spearville will be a heavy favorite again this week against winless Ashland. Finally, Victoria stayed in the fifth spot in this week’s poll after a 50-0 shutout of Ellinwood. The Knights may get a test this week when they travel to take on 8M-II No. 5 Otis-Bison. The top two teams in the 8-Man, Division II poll continue to represent the eastern side of the bracket. Hanover remains in the top spot after another dominating win. Friday, the Wildcats won at Southern Coffey County, 50-0. Hanover has now given up only 12 total points this season. Pike Valley remains in the No. 2 spot after rolling past Stockton, 56-6. The Panthers’ real regular season test comes this week when they host 8M-I No. 2 Osborne. Those two teams feature some of the fastest backfield in all of Kansas. Hutchinson Central Christian moves up one spot to No. 3 in this week’s poll. The Cougars rolled to a 64-16 win over Stafford on Friday and travel to winless Fairfield this week. Hodgeman County comes in right behind Central Christian at No. 4. The Longhorns rebounded from their loss to Spearville with a 74-0 blanking of Deerfield. Hodgeman County will get another test this week when the Longhorns travel to take on unbeaten South Central. Finally, Otis-Bison falls two spots to No. 5 in this week’s poll after a 36-12 loss to Central Plains. The Oilers and Cougars were tied a 6 at halftime, but Central Plains took control in the second half in winning by 24. Otis-Bison will be tested again this week as the Cougars will host 8M-I No. 5 Victoria.